Ticketing kiosks have become nearly universal in airports today. Now their use is expanding to other areas as well. If there’s one place where the self-service kiosk has proven its value, it’s at the airport. Kiosks began appearing at airports around the world in the early 1990s, providing wayfinding and flight information services as well as allowing travelers to purchase tickets and print boarding passes. By 2004, according to the International Air Transportation Association, 15 percent of flyers were checking in to their flights using a self-service kiosk. By 2012, that figure had doubled to 30 percent. Today, nearly every airline incorporates a check-in kiosk into their operation. Thanks to their track record of success and with airports facing ever-increasing congestion, airports are looking for other areas where kiosks can help increase efficiency and improve the traveling experience. A 2015 report from the Federal Aviation Administration warns that steady traffic growth over the next decade or so will aggravate congestion at airports, leading to increased delays. The issue could become particularly severe at major hubs, including airports in New York, Philadelphia and Atlanta. As a result, travelers are becoming increasingly frustrated with the long waits and poor experience created by that congestion. In an effort to get a handle on the situation, airports are taking the lessons learned from the use of kiosks in the boarding process and applying them to other areas of their operation. “Now airports are looking at other services such as retail and food ordering where kiosks can help speed up the process,” said Frank Olea, CEO of Olea Kiosks. Philadelphia International Airport, for example, recently wrapped up a $30 million renovation of the facility’s Terminal B that saw the addition of several new restaurants and hundreds of iPad kiosks at seats in the terminal where flyers can look up flight information, browse the Web and order food and drinks that can be delivered right to them. The renovation was funded by New York-based OTG Management, which has deployed similar technology in 10 airports around the country. OTG founder Rick Blatstein told the Philadelphia Inquirer that revenue per passenger at airports with such technology is 50 percent higher than the average for the top 50 airports in North America. Even the most mundane passenger needs are being met with kiosks. In 2015, Olea Kiosks was approached by JCDecaux Airport Inc., a major player in airport advertising, to engineer and manufacturer a digital charging station kiosk to allow travelers to charge their mobile devices. The 8-feet-tall unit is dual-sided, with the same charging features available on both sides of the device. A shelf on each side features 2 QI wireless chargers (4 total), 4 110-volt outlets (8 total), and 3 USB outlets (6 total). 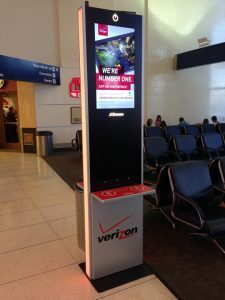 The kiosks showcase Verizon and Chase Bank branding, highlighted by a slim 32” monitor that runs sponsor video commercials. The kiosk can be managed remotely, with the ability to update content, cycle power, and shut down the system as needed. Olea has manufactured hundreds of charging kiosks that have been deployed in Orlando, Boston, Miami, Newark, JFK, LAX and Houston’s George Bush Intercontinental Airport. One of the worst aspects of traveling these days is waiting in long lines to pass through security screening. The issue can be particularly aggravating for international travelers. According to the U.S. Customs and Border Patrol Airport Wait Times website, the time it takes travelers to pass through customs at Newark’s Liberty International Airport was as long as 160 minutes for some travelers in early November, while at New York’s John F Kennedy International Airport the time was as long as 177 minutes. Credit card tracking website Miles.com cited those airports as being among the 10 worst in the country for customs wait times. To help alleviate those issues, airports around the country have introduced kiosk-based passport screening systems that are dramatically speeding up customs processing times. In 2013, for example, Olea Kiosks introduced its Automated Passport Solution (APS), a touchscreen kiosk-based customs inspection system. The unit includes a passport scanner, web camera, an 80mm thermal printer, and is ADA 508 compliant. 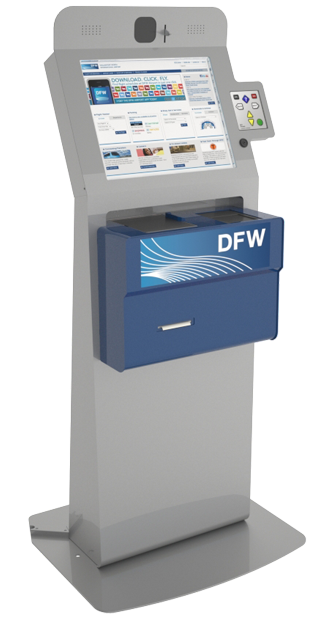 Olea installed its first APS kiosk at the Dallas/Fort Worth International Airport in 2013. “We did DFW primarily because of the federal budget sequester,” Olea said. The APS software provides an easy-to-use touchscreen interface that allows the passenger to navigate through the software without needing human assistance. The unit first scans the passenger’s passport using the attached passport scanner peripheral, retrieving the passenger’s personal information from the integrated customs database. The passenger then responds to questions similar to those asked by a human customs official. The thermal printer attachment allows the passenger to print their answers directly from the APS system. In addition, the webcam peripheral takes the passenger’s photograph and stores that in the customs database. The APS kiosk is built on Olea’s Metrolite Kiosk framework, utilizing a durable kiosk framework manufactured in the United States. The Metrolite is highly expandable and supports the addition of new peripherals to accommodate custom applications. For the APS, the Metrolite has already been outfitted with the capability to attach a fingerprint reader peripheral to provide for an even greater level of security. “Once the kiosks were installed the waits at DFW immediately fell to 30 to 40 minutes,” Olea said. Miles.com currently ranks DFW as one of the 10 best airports in the country for wait times, with an average of just above 15 minutes. Today, passport kiosks have become a regular feature of airports around the country, and they’re being well-received by travelers. The International Air Transport Association found that the number of passengers using automated immigration gates and kiosks increased by 6 percent in 2017 compared with the previous year, reaching 58 percent of all passengers, with a satisfaction rate of 90 percent. According to the Sydney, Australia-based Centre of Aviation, those figures indicate that it’s not fancy terminals, endless shopping options, gymnasiums or tropical gardens that dominate most travelers’ needs, wants and demands. “Rather, they (still) simply want to get through the airport as quickly as possible at either end of their journey,” CAPA officials said. At the end of the day, the best way to know how self-service kiosks can help improve airport operations is to work with an experienced kiosk vendor who is well-versed in the ever-changing regulatory environment. Olea Kiosks stands ready to help.